Wonderfully situated between the Louvre Museum and the Place Vendôme, the Hotel du Continent invites you to enjoy its rooms designed by Christian Lacroix and take advantage of the wide range of high-end services our establishment offers. At the Hotel du Continent, welcome is not a word we take lightly and so we are happy to be able to receive you 24/7. Indeed, you could say our reception never sleeps! In addition, our staff is multilingual, and our concierge is always ready to meet your wishes. Regarding facilities, please note that all rooms have free Wi-Fi access, flat-screen TVs and a carefully stocked minibar. 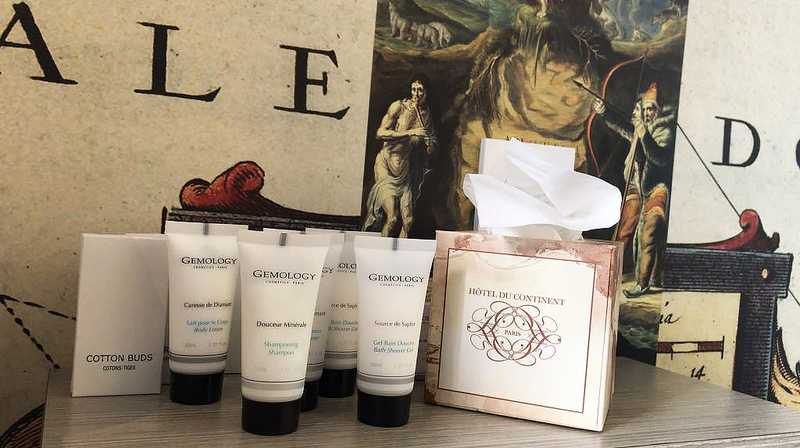 In your private bathroom you’ll find a hairdryer, slippers, fluffy bathrobes and, for even more pleasure, a selection of hospitality products from the Gemology range that will leave your skin deliciously hydrated ... And delicately scented. After a day of work, strolling through the city, sightseeing or shopping, you’ll find your room and its decor to be beautifully ... international. Asia, Africa, the Americas, even the geographical poles (the ‘sixth continent’ born of the fertile imagination of Christian Lacroix) reveal themselves to you via the walls, the furniture, their moods, their colours, and their history. Close your eyes and be transported by images of old maps, great discoveries, Kabyle carpets, and lush vegetation. And, in the morning, there’s another day and another delight as our breakfast ‘à la française’ awaits you until 11:00! Have a wonderful stay at the Hotel du Continent!